Cycle around, Koh Kred, a small island in the Chao Phraya River in the province of Nonthaburi. 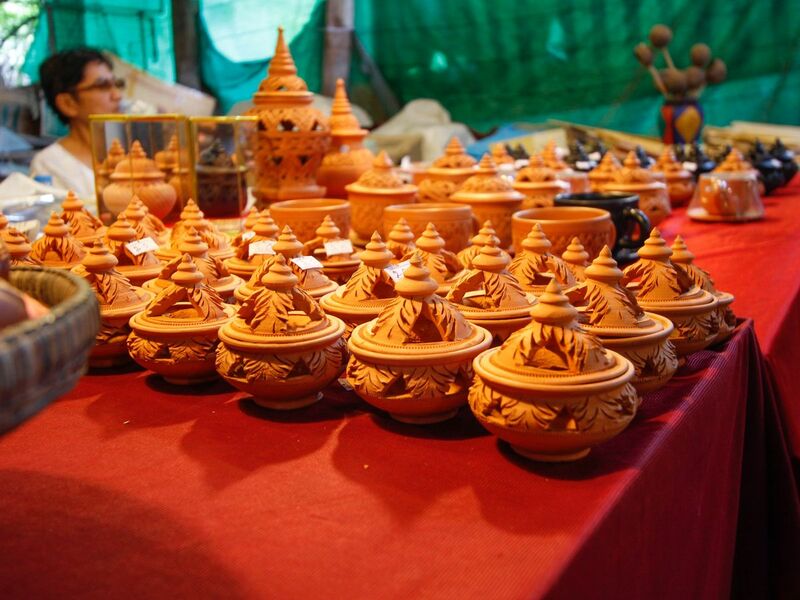 Explore local communities and learn to mold and sculpt your clay pot. Head over to our destination (about 30-45mins depend on traffic), then take a short boat ride to Koh Kred (5mins). Stop by at the local Koh Kred temple to pay respects and sightsee the surrounding. The island, itself, is a little hard to access. You either have to do a few transits or take a long boat ride from downtown to the island. Let me take you there and just sit back and enjoy the vibe. The island was a refuge shelter for the Mon tribes who dominated central Thailand between the 6th and 10th centuries and have retained a distinct identity in their version of Buddhism and, particularly at Koh Kred, and their local pottery. The island dates to 1722, when a canal was constructed as a shortcut to bypass a bend in the Om Kret branch of the Chao Phraya river. As the canal was widened several times, the section cut off eventually became a separate island.